Help your dog have a great night's rest with these Herb Green Sweet Dreams Thermal Dog Pajamas by Doggie Design! Dogs will stay warm this season as they go to dreamland. These comfortable dog pajamas feature a super soft 70% Cotton, 25% Polyester, 5% Spandex blend. 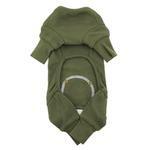 This dog PJ has fantastic stretch which makes it very comfortable to wear and easy to put on. The faux flap bottom is embellished with cute buttons and embroidery that says, "Sweet Dreams." The soft ribbed cuffs ensure your pup stays cozy without drafts. The cuffs can be worn folded for shorter legs. These dog pajamas also feature an open tail end with a high cut stay-dry tummy for last-minute potty breaks before bed. Keeping your dog in pajamas is a great idea, especially if your pets sleep with you. These PJs are an effective solution for reducing dander and minimizes shedding in your bed for a healthier night's sleep. Does your dog suffer from allergies or skin conditions? The full coverage and breathable cotton blend of these dog PJs offer a great solution for dogs prone to itching, scratching and biting. Give your pet with skin conditions a chance to heal with this cute and functional garment. These dog jammies are also great for pictures and keeping hair contained. Look for our other colors of Sweet Dreams Embroidered Dog Pajamas too! Sweet Dreams Thermal Dog Pajamas by Doggie Design - Herb Green Customer Photos - Send us your photo! Louis is kind and love and love's play with he's son bear now they are twinsies they're wearing the same sweet dreams thermal doggie pajamas by doggie design they both love it it keeps them nice and warm this is what I bought them for early Christmas gift I bought them for my sister's dogs ? Pablo love's children Pablo really friendly Herb Green Sweet Dreams Thermal Dog Pajamas by Doggie Design it keeps Pablo nice and warm he love he pajamas Pablo adorable ? Posted On 12/03/18 by SANTA MONICA from SANTA MONICA, CA Yes, SANTA MONICA recommends this product! Posted On 01/19/18 by Ann R from Milton, DE Yes, Ann R recommends this product! Posted On 01/11/18 by Marilyn H from Dade City, FL Yes, Marilyn H recommends this product! Coco and I love her pj's. They fit perfectly and I know they will keep her warm. I give them a 5 star. Yes Florida does get cold. Posted On 12/03/17 by Juana J from Sacramento, Yes, Juana J recommends this product! Posted On 12/03/17 by Juana J from Sacramento , CA Yes, Juana J recommends this product! Posted On 11/23/17 by Juana Jose from Sacramento, CA Yes, Juana Jose recommends this product! Posted On 11/22/17 by Tammy S from Simpsonville, SC Yes, Tammy S recommends this product! Posted On 11/14/17 by Cynthia C from Springfield, VA Yes, Cynthia C recommends this product! My Yorkie now has 2 pair of these Long Johns and he loves them. He loves clothes and he looks adorable in these. Posted On 11/03/17 by Rebecca T from Quincy, IL Yes, Rebecca T recommends this product! Lightweight but warm & cozy. Bella & Tucker love them as much as I do. I went up in size since the are both on the edge. The pjs are a little big but since they are 100% cotton, may shrink a little. I like this store very much, they have a great variety of dog items. I wish that they would carry more for larger dogs-specially clothes.